Be it a teacher, mother or any other occupation we beings have a tendency to take on so much till we explode. If you understand, say “understand.” If you don’t understand, say “don’t understand." But if you understand and say “don’t understand." How do I understand that you understand? Understand! So can you tell me what this word means *ducks and runs* . Oh Suasan, Susan. Go easy on AG. He says he no understandy, which I perfectly understood to mean he doesn't understand, but he does- enough to say he doesn't understandy , when he does. Understand? No arguments over coffee at my blog tomorrow, please. The truth is dictionaries don't always help. Anyway, a teacher may be considered 'all-knowing' in India which shows some respect, but here where I live, teachers(inclusive language teachers) get no respect at all from the surrounding society. There are two main reasons for that: first, a teacher must also play the roles of: parent, brother, friend, nurse, social worker. etc.. Second, teachers usually go along with lies such as 'money can buy all' including the Ability and Will of a child to learn. Teachers are important and make a difference. 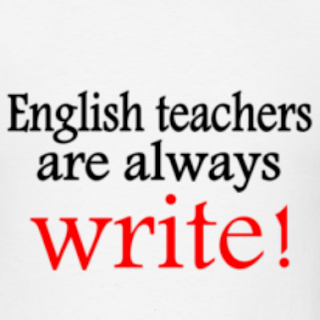 You are not simply a teacher of English, dear Susan but a good and effective teacher of English. Because you're just a positive, encouraging and clearly targeted person. Oh dear, that gives me the chance to improve myself. I like to be asked about language. Don't get irritated. If all look up in the dictionary, who is going to be a teacher and who to be taught. It is so much easier to ask and let someone else figure out the answer than do it yourself, no matter which profession we talk about. Thanks for the food for thought. Have a lovely weekend. Jim is still keeping me company!!!! You mean you don't know the meaning of all the words?? What a fun read, Susan. You never fail to educate and entertain. 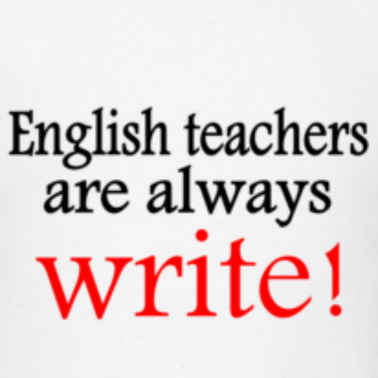 hahaha ... English Teachers are humans after all. Love this kind of raving, it can rave up my funny bones. And what a day to trigger my laughing spirit. A friend of mine who teaches English, has a son who expect her to be All Knowing. Now I can see the correlation of this topic to her situation. I love English, language, literature, and words but please don't hold me accountable to perfect grammar! Hey, if I can understandy, how come EVERYONE cannot understandy? Love, hugs, and an iPod dictionary to YOU, SD! Well, now I realise that every job has its own perils. Swap??? Not for anything. We love to complain about what we love most. Humans are a bunch of paradoxes. Maths, I don't even want to think. Taxes? Ridiculous. Perhaps you should write a post on that. Welcome here. Glad that you found your way here. Happy to see your comment. Well, my state of mind is a personal affair. Why don't you meet me to know more? Best wishes. Why is the situation so, DUTA. Why are teacher's not respected? It is quite sad. The present gen-X is like that. Since information is readily available through the net, the value of teachers is coming down, maybe. Thanks for you words of appreciation, Betty. Your words brought cheer on a Sunday afternoon. Your comment gives me another way of looking at things. Words and dictionaries are just one part of language, there are many many other aspects to it where the teacher's presence is required. Welcome. Well, I see that everyone has undergone this at some point. What a lark. What a lark! Absolutely. Laziness is becoming the order of the day. Finding out anything for oneself involves a lot of work and hence people refrain from that. Have a great week ahead, Elizabeth. Angie!!!!! I wish you a great weekend as well, dear Angie. It is a joy to see your comments, Inday. Glad that you could make it. language teachers are easy targets. Well, . . . I know that you love Literature. I'm glad that you do. I think no one perfects grammar perfectly. iPod dictionary? Can I send you my mailing address for the iPod? Thanks for being so generous Steve. Glad to know that your mom and you are in tune with Literature. Wow! You can relate well with the plights I face. Have a great week ahead, Yuv. Have a splendid week ahead, dear Zuzana. as I am a teacher of English myself you already must know how related I am to ALL this stuff. If my native colleagues so often do not know why should I? As for the blogs... I must admit I became addicted to bloggging ever since I started my first one for the school... now I must have seven blogs altogether!!! It's great to know and let know that being a good teacher has not so much to do with knowing every single word, meaning and nuance, but with getting to the students and feeling that after an academic year they are so happy they learnt lots of English, had lots of fun... and will always remember you for helping create a sweet atmosphere in the classroom... hmmmmm hey, how about that? I have a blog but I am not an English teacher. I also love to teach it is the best profession. I can relate, Susan! As an editor with a degree in English Lit, I receive the same treatment. I really think that type of knowledge is in danger of becoming a lost art and as time goes on there will be even fewer people who are good with language. So keep using your gift and teaching our children! Thanks for what you do! I know that you are a teacher of English, Dulce and I'm glad that you can relate to what I'm saying. I will be honoured to have you in class but I will be too shy, I reckon. But I would definitely love to sit in your classes. Oh nooooooooo. Teaching is just great :) Thanks for coming by, dear CS. I can hear when you say that language is becoming a dead art. Thanks for the lovely words, Jean. They are much appreciated. I can relate. Having learned the English language better than the rest of my relatives, I am the one to translate, read, write, and make decisions. It is at times less than enjoyable to visit my mother to be given a stack of papers to translate or letters to write. But what I find more frustrating is when traveling in a new city, I am asked to do the itinerary for all because "we have never been here and you speak English better"...I have never been there either. I can totally relate to you on this one. I am an English faculty in a college in India and have been teaching English for more than 6 years now. Reading your article made me grin and smile several times.I have had similar experiences which you have narrated so delightfully. Glad to know that we share the same profession. Whatever said and done, teaching is something which satisfies the inner self. You're also an English teacher, Sus?! Takes one to know one, I s'pose. Haha. I'd love to be in your school. In my university, it goes, "you're a teacher, then you must have publications in refereed journals." Ugh! Even though I am not an English teacher as yet, I am still asked questions related to grammar and vocabulary. That has to do with the interest I display in this language. I can totally sympathize with your plight, because I too, at times, snap at my friends saying: "I am not a walking dictionary, man!" At other times, I don't answer at all, and just pass on the dictionary. I think this is important. It makes the enquirer self-reliant. This is the way to go! One has got to help oneself! No dearth of English material, these days.